Amazon,the online retail giant unveil the plan to offer its own Kindle Tablet computer running Google’s Android OS , perhaps as early as October. 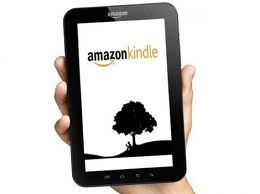 Most likely to be branded as Amazon Kindle tablet, it will carry multi-touch supporting 7 inch colour display, Android operating system, and a bunch of Amazon apps. The Amazon tablet will carry an operating system built from the scratch using the Android OS code but the prototype unit did not have any cue that indicated presence of Android, visually. The user interface of the tablet will complement to the Amazon.com redesign which is being tested currently. The tablet will carry all Amazon Apps — Kindle Reader, Amazon Cloud Player, Instant Video Player and the Amazon App Store for apps. From the details so far, it appears that the Amazon tablet will have more of a host of cloud services apps supporting operating system. Hardware of the tablet would be pretty similar to that of the rival Nook Color. Amazon tablet will have a two finger multi-touch supporting capacitive display and not any e-ink version. The tablet will carry a single core chip and would offer about 6 GB on-board storage. The final version should carry a micro SD card expansion slot as the 6 GB storage is too less for storing multimedia offline. The device could be priced at $300 or lower, significantly less than the base-level $500 iPad. Research firm Forrester said last week that it expects Amazon to sell 3 million to 5 million tablets in the fourth quarter this year if it can keep up with the demand.